Constructed of all aluminum extrusion and materials. 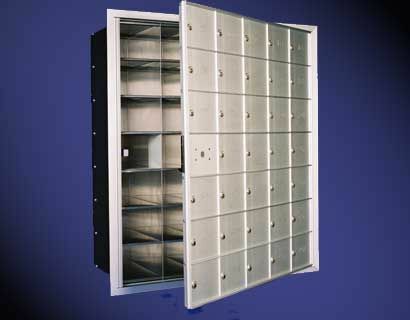 Standard 900 series horizontal mailboxes are available in "A" size compartments, 5" h x 6" w and configured in modules 3, 4 or 5 boxes wide and 5, 6 or 7 boxes high. Each 1/8" extruded aluminum door swings on a continous hinge and is equipped with a 5 pin cylinder cam lock with 3 keys (1500 changes).Doors include permanent 3/4" high engraved identification for a neat, uncluttered appearance. Larger size boxes can be integrated into all modules for volume incoming mail as well as outgoing mail through a mail slot. Package delivery can be accommodated with the addition of parcel boxes with a dual locking system. All modules have standard 3/4" integral trim for stability, easy installation and a finished appearance when recessed into a wall opening. Consult our knowledgeable sales staff for assistance with customizing units for your specific need. FRONT LOADING: Master door swings on a continous hinge and features a top to bottom locking bar for security. 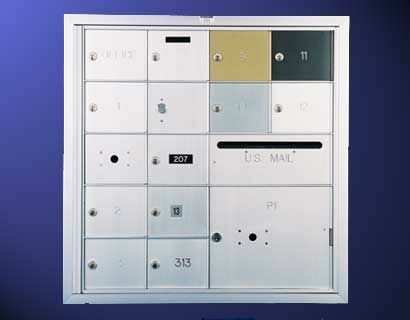 One compartment is required for postal access and cannot be used for mail delivery, but with the addition of a mail slot in the door it becomes an outgoing letter box. Postal access door is prepped to accept postal lock provided and installed by local postal authority. 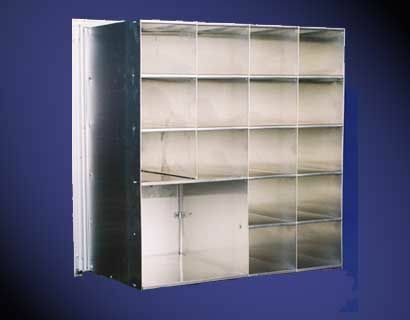 All Horizontal Mail Boxes are recess-mounted.